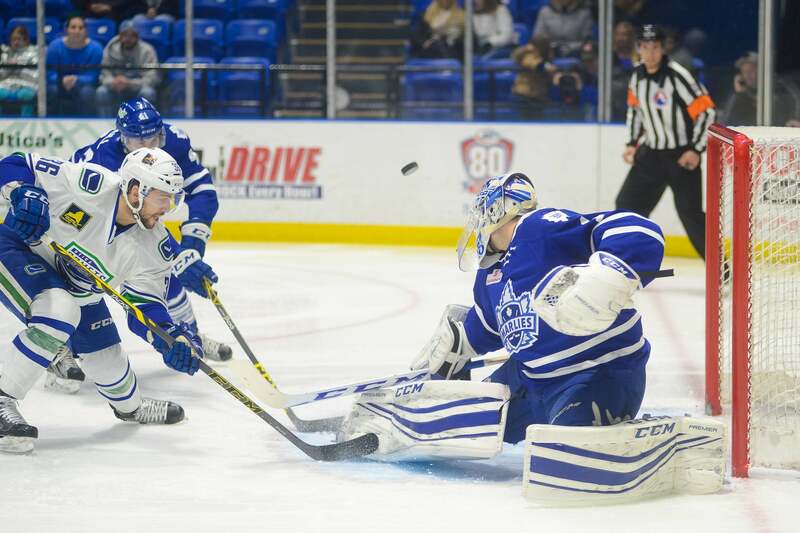 The Comets returned home after a three-game road trip and claimed their first point in seven tries in a 3-2 shootout loss to the Toronto Marlies at the Utica Memorial Auditorium on Wednesday night. Despite outshooting the Marlies 37-22, the Comets suffered their seventh consecutive loss. Jon Landry (1-0-1) and Darren Archibald (1-0-1) provided the goals for the Comets while Richard Bachman was in net with a successful 25 saves. Hunter Shinkaruk (0-2-2) tied Jordan Subban for the team lead in assists with a two assist night. The special teams played well, as the power play unit scored and the penalty-killing unit enjoyed a perfect 5-for-5 night. The Comets surrendered the first goal of the game for fourth straight game when the Marlies struck 9:54 in the first period. Nikita Soshnikov scored his 12th goal of the season when he ripped a breakaway slap shot past Bachman. It looked like the Comets would head to the locker room down by 1 but with just 17 seconds left in the period the power play came to the rescue. Friesen was able to connect with Shinkaruk, who made the pass to Jon Landry at the top of the slot. Landry wound up and fired a slap shot that snuck through traffic and evaded the glove of Bibeau for his third goal. The next goal of the night came when penalties were called on both teams that led to 4-on-4 hockey for 24 seconds. Ryan Rupert jammed a loose pack into the net at the 9:14 mark of the second period for the 2-1 lead. With seven minutes left in the third period of the game, the Comets were able to tie the game once again. As Darren Archibald fell to the ice he was able to successfully whack a Hunter Shinkaruk rebound past Bibeau’s foot. A high-energy, fast-paced overtime proved to be fruitless as neither team could score on a plethora of chances. After Soshnikov scored in the first round of the shootout, neither goaltender would allow another goal to give the Marlies the 3-2 shootout decision. With the shootout loss, the Comets record falls to 16-15-3-3. The Comets head to Syracuse for a 7pm Galaxy Cup showdown on Friday before returning home to host the Albany Devils on Saturday at 7pm at The AUD. Tonight’s Game: The Comets will return home from a three-game weekend tonight to take on the Toronto Maple Leafs American Hockey League affiliate, the Toronto Marlies. Game time at the Utica Memorial Auditorium is scheduled for 7 p.m. The Comets are looking to snap a season-high six game losing streak against the AHL’s top-ranked team. The Comets are currently sitting in fifth place in the Eastern Conference’s North Division with 37 points, while Toronto sits atop the North Division and the entire league with 60 points. Last Game: The Utica Comets surrendered a late short-handed goal to the Hershey Bears to break a 3-3 tie, before ultimately losing 6-3 at the Giant Center on Sunday afternoon. The loss sends the Comets to their sixth straight defeat after gaining a point in 14 of 16 games. Cole Cassels (0-2-2) and Joseph LaBate (1-1-2) recorded multi-point nights. Hunter Shinkaruk (1-0-1) scored his team-leading 15th goal of the season, and newcomer Michael Pereira (1-0-1) scored his first as a Comet. Joe Cannata made 33 saves in the loss. Scouting the Marlies: The Marlies have scored 145 goals this season that is the second-most in the league behind the Texas Stars who have scored 148. The Marlies 145 goals is 24 more goals scored than the third place team, the Penguins, have. They score – a lot. Combine that with their 89 goals allowed, the fourth fewest in the league, and their ridiculous record of 29-7-2-0 no longer looks so shocking. The Comets catch somewhat of a break with the Marlies top scorer, and third-leading league scoring, William Nylander (14-20-34) currently on the Marlies. In fact, Josh Leivo (11-19-30) the Marlies third-leading scorer is also with the parent club. Leaving defenseman T.J. Brennan (14-20-34) and forward Mark Arcobello (12-16-28) as the team’s leading active scorers. Welcome, and Welcome Back: Two Comets are slated to be making their Utica Memorial Auditorium debut tonight, and two will be returning. Michael Pereira, of the Reading Royals, and Brandon Marino of the Brampton Beast, signed PTO’s with the Comets recently. Curtis Valk was recalled by the Comets yesterday, and Andrey Pedan was reassigned to Utica by the Canucks as well. Hey Now, You’re an All-Star: The American Hockey League announced on Thursday that Hunter Shinkaruk has been named to the Eastern Conference All-Star Classic Roster. Shinkaruk, 21, in just his second season as a professional, leads the Utica Comets in goals (15), power-play goals (8), and points (27) in 30 games played. His 12 assists are the third-most on the team. The 24th overall pick in the 2013 NHL Entry Level Draft made his National Hockey League debut for the Canucks against the Montreal Canadiens on Nov. 16. In 2014-15, his first professional season, Shinkaruk recorded 31 points (16-15-31) and 28 penalty minutes over 74 games played. The Calgary, Alberta native also scored six points (4-2-6) in 23 postseason games with Utica through the 2015 Calder Cup Finals. The 2016 Toyota AHL All-Star Classic, will take place January 31 and February 1 in Syracuse, N.Y. Injury Report: According to Travis Green in post-practice interviews yesterday, Ronalds Kenins, Alexandre Grenier and Blair Jones are not expected to suit up tonight. Milesone Alerts: Head Coach Travis Green is two regular season wins away from 100 career wins. Lucky Number 3: When the Comets fail to reach the three-goal mark in a game, the team is 0-12-3-1 this season. When they successfully strike three times, the team is 16-3-0-1. Next Game: The Comets head to Syracuse for a 7pm Galaxy Cup showdown on Friday before returning home to host the Albany Devils on Saturday at 7pm at The AUD.